Remember everything Jamie and Claire tried to do in Paris? Forget about it. The lovers returned to Lallybroch on Outlander Season 2 Episode 8 and something became clear. If ya can't beat 'em, join 'em. That's right. Since they weren't going to be able to stop the Jacobite rebellion from happening, then they're going to do their darndest to ensure the Jacobites come out on top of the rebellion. Is your head spinning yet? It was nice to see Jenny and Ian again, to learn they had expanded their family yet again. Even if that expansion was a bit bittersweet for the couple who hadn't successfully done the same. The scene with Jamie holding the wee bairn (did we learn whether the new baby was a niece or nephew?) was touching. 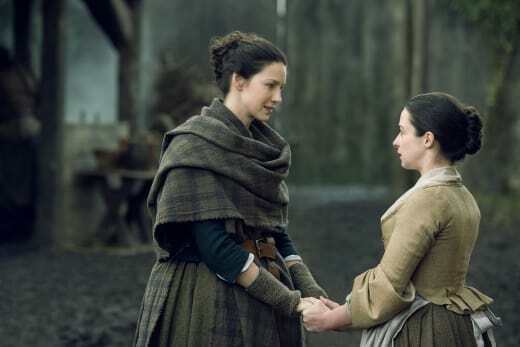 Jenny reminding Claire that men don't get that close with their own children until they've left the womb made the moment all the more poignant, especially since we know Jamie is going to miss the birth -- and who knows how many years, if not the entire life -- of his next daughter, too. But they didn't stay long at Lallybroch. 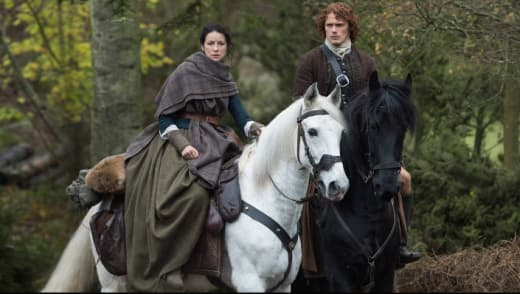 After a package arrived from France that included a letter upon which Jamie's name was forged making him a traitor against the King, he and Claire realized the best way to change the future (because Jamie was still all in), was to win the Jacobite Rebellion. They couldn't just sit and do nothing, watching their family and friends fall, so joining Prince Charles and finding men for the rebellion to really make a stand was the only obvious solution. I'll be honest, my head starts to spin with all the political talk. I need words on paper in front of me to follow those types of plans, so if I get it wrong, please, please set me straight in the comments. I definitely had an AHA moment by the end of the hour. 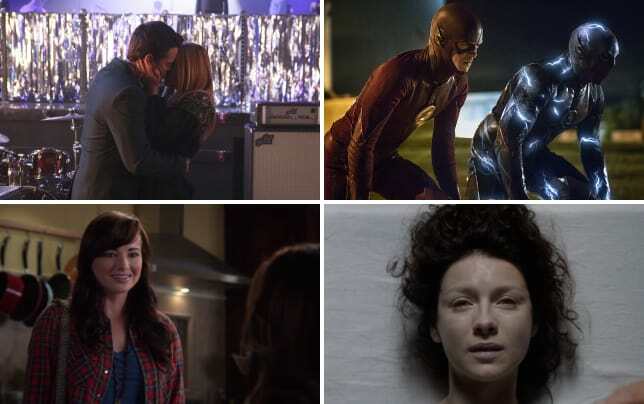 So it was goodbye again. But the confusing part was about Fergus again. How are they going to treat Fergus going forward? Does he ever become more than a tagalong? With the way the boy looks up to both Jamie and Claire, it's surprising to me that both haven't seen an opportunity to adopt him, to bring him into the family as more than a...well, what is he? A page? I'm not sure really. I suppose in these times nobody did that with stray children. They just offered them lodging and allowed them to earn their keep. But Claire isn't from those times. Maybe that's my sticking point. She seems so unconcerned with him. I realize he was a different child in the books, but here he's more innocent than expected. Lord Lovat was a towering and gruff man, who believed women (and probably children) should be seen and not heard. But from the little we got to know him, I'm betting he'd get over that behavior should a capable woman or child challenge him on it. Most probably ran screaming in the other direction. The idea was to get old grandsire, who Jamie had only met once in his life, to rally around with an army. Of course, nothing is ever that easy. Jamie realized pretty early that the guy wanted something. That something turned out to be Lallybroch. Lallybroch or to sully Claire's honor. It was quite fun watching Jamie's reaction to that and learning Lovat had a respect for something -- witchcraft. Colum MacKenzie happened to be visiting at the same time, which meant the whole witchcraft trial was brought up again. He even brought Laoghaire with him, making the entire situation a bit worse. 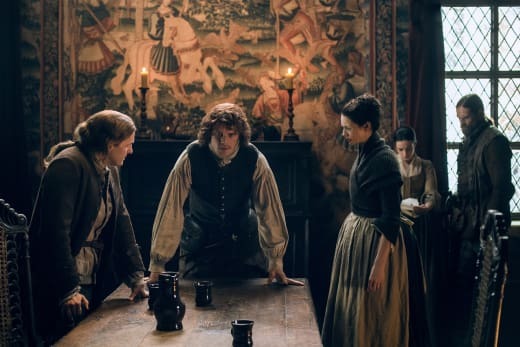 Except did you notice that for as horrible as it was for Claire to dredge up the memory of being accused as a witch and standing trial, she and Jamie had no problem equally using her status as La Dame Blanche when it suited them? Be careful what you wish for, as you just may get it. I kind of got lost with what Lovat wanted of his son, Simon. 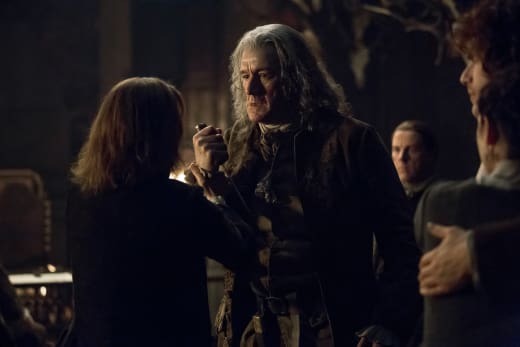 I did understand what Claire hoped Laoghaire would provide Simon, and Simon followed through when Claire used her "sorcery" in the room where they were discussing neutrality. The neutrality? Also completely lost on me. Why were they making the decision to stay out of it completely? I mean, I guess it's good, as their families would be safe, right? Or wasn't that the point... Help? Nonetheless, Lord Lovat balked a bit, decided to give to his son his army, so Jamie and Claire thought they were leaving with nothing, and in fact had an entire army behind them. How many more friends and family do they know to use such tactics to get an army? Most of whom they know from Outlander Season 1 already pledged their support to the Jacobite cause, and they had no army. Will Jamie and Claire try to contact Prince Charles with a different agenda? They kind of messed that up the first go around, and now they really want funds. I thought seeing Laoghaire again was interesting. She'll never give up on Jamie, but she sure tried to be pious. Jamie's thank you to her was awful. He didn't even know what she did. Wouldn't it be fun to see her and Louise in the same room? What's next, you guys? Will Laoghaire ever get her hooks into Jamie? Are we done with tactical planning? Let me know your thoughts in the comments!! Who's glad to be back in romantic Scotland?! Claire: They say the definition of insanity is doing the same thing over and over and expecting a different result. Jamie: Well, I dinna ken who 'they' are Sassenach, but I'll wager 'they' have traveled through time. Permalink: Well, I dinna ken who 'they' are Sassenach, but I'll wager 'they' have traveled through time. Claire: So, will I be allowed to join you at dinner tonight? Jamie: Aye. My grandsa isn't opposed to a little decoration at the dinner table, as long as the decoration doesna speak.